With nature’s spectacle of colorful autumn leaves as a backdrop, fall is a perfect time to travel – but many of the most popular places in the US are almost as busy as they are in the summer. Here, we pick the best alternative places to enjoy the season and escape the crowds. Atlanta is a major airline hub for the Southeast, and a mere two-hour drive north puts you on the edge of the Appalachians at Chattanooga. 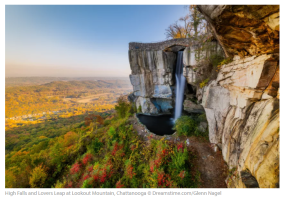 Take the Incline Railway to the top of Lookout Mountain, then hike past sandstone formations and cross a suspension bridge at Rock City for a sweeping view of seven states. Alternatively, descend beneath the mountain at Ruby Falls to see the highest underground waterfall in the world. Downtown, bike or stroll along the Tennessee Riverpark, or relax on an old-style riverboat cruise.